The Senate President, Sen. David Mark, on Wednesday in Abuja, overruled the attempt by some APC senators to defer the screening of ministerial nominees which commenced on Wednesday. Six ministerial nominees were screened on Wednesday out of the 12 names forwarded to the Senate by President Goodluck Jonathan for confirmation. The nominees are Sen. Musiliu Obanikoro (Lagos), Hon. Mohammed Wakil (Borno), and Amb. Aminu Wali (Kano). Others are; Mrs Akon Eyakenyi (Akwa Ibom), Mrs Lawrencia Mallam (Kaduna) and Gen. Aliyu Gusau (rtd). Earlier, Sen. Femi Ojudu (APC-Ekiti) urged the Senate to defer screening, saying that Senators needed time to study the records of the ministerial nominees to effectively participate in the exercise. He observed that screening of ministerial nominees was a crucial function of the legislature which was always handled with high sense of seriousness. “We need time to study the volume of curriculum vitae of the nominees so that Senators can make useful inputs into the screening. “This is a very serious matter which is given priority attention by parliament all over the world. The screening should be deferred to enable us study their records properly,” he argued. Sen. Anthony Adeniyi (APC-Ekiti) on his part asked for deferment of the screening because the security records of the nominees were not attached to their resumes circulated among the senators. “I have scanned the documents given to us and there is nothing to show that all these nominees subjected themselves to security clearance. “So, this exercise should be put on hold until these records are provided to us,” he urged. But the Senate President was quick to explain that all the nominees fulfilled the requirement for security clearance by the appropriate security agencies. Mark ruled Ojudu and Adeniyi out of order, insisting that the screening should commence while senators could raise any discrepancies observed in a nominee’s record. “I know you can read these documents within a few minutes. If there is any question that you want to ask, you will also be free to ask. “With all due respect all the points you raised if you go through the CVs, they have fulfilled these conditions. “If there is any that we have doubt when he or she comes here we can raise that. So, I rule you out of order, ” Mark ruled. Sen. Musiliu Obanikoro, and Hon. Mohammed Wakil were both asked to take a bow and leave without any questions from the senators, a tradition reserved for former lawmakers. However, the senators in a unanimous voice vote allowed Aliyu Gusau, a retired General, to take a bow and leave the chamber without uttering a word. 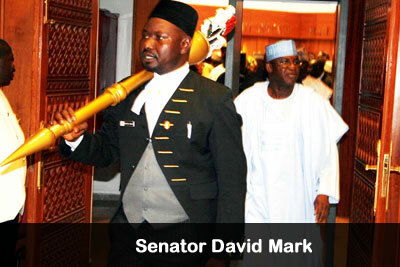 Over 25 senators, from both sides of the chamber, escorted the former security chief from the chambers. The senate is to continue screening of the the remaining six ministerial nominees on Thursday. Those to be screened on Thursday are Boni Haruna (Adamawa), Dr Khaliru Alhassan (Sokoto), and Hajiya Jamila Salik (Kano).